Rocks Locks Locksmith Services serves Hartley Wintney residents and businesses and being based just 10 minutes down the A30 in Blackwater, Rocks Locks is ideally placed to be your trusted, reliable, local locksmith. Rocks Locks Locksmith Services takes pride in delivering the highest levels of service to the people of Hartley Wintney. You may have seen Stuart's van around the area as he frequently visits customers in Hartley Wintney and the surrounding villages. If you are looking for a local locksmith you can trust, then look no further! Stuart has gained himself a strong reputation for providing high quality locksmithing without compromising on service. 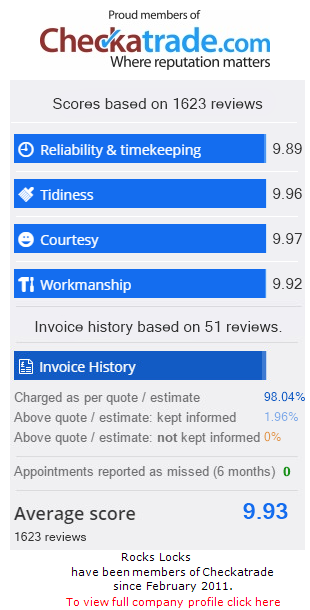 Stuart doesn't charge a Call Out fee like a lot of other local locksmiths, and will be honest and transparent on the cost of your repair. It is difficult to price a job on the phone, but he can give you an indicator and then an accurate quote and once he has seen the issue, and before he starts any work. Rocks Locks Locksmith Services include fast emergency response, lock repairs, replacement locks, key cutting, access systems, installing safes, window and door replacement, installation of alarms and CCTV, insurance claim survey reports and security advice.